Previously: Impact Global Champion Eli Drake successfully defended his title against Petey Williams. Tonight: It’s a special Thanksgiving edition of Impact, featuring the return of the Turkey Suit. The main event will be a five-on-five tag team match in Eli Drake’s Gravy Train Turkey Trot (aka The Turkey Bowl). - In anticipation of tonight’s main event, Jeremy Borash said they’ll be looking back at past Turkey Bowl matches. Shelley and Bashir worked together to beat down Rhyno. But each time one of them went for the pin, the other would pull him off. They argued and ended up fighting each other. Rhyno took the chance to hit the Gore on Shelley for the win. After the match, Mick Foley came down to the ring when Shelley refused to put on the Turkey Suit. Foley threatened to fire Shelley unless he put it on. - In the back, Borash conducted the random draw for the participants in the main event. Chef Robert Irvine cooked up a feast for JB and the others. - Throughout the night, members of the roster revealed their best Thanksgiving memory and said what they’re thankful for. - Borash, Eli Drake, and Chris Adonis drew the names for the Turkey Bowl match. This went on for several segments. 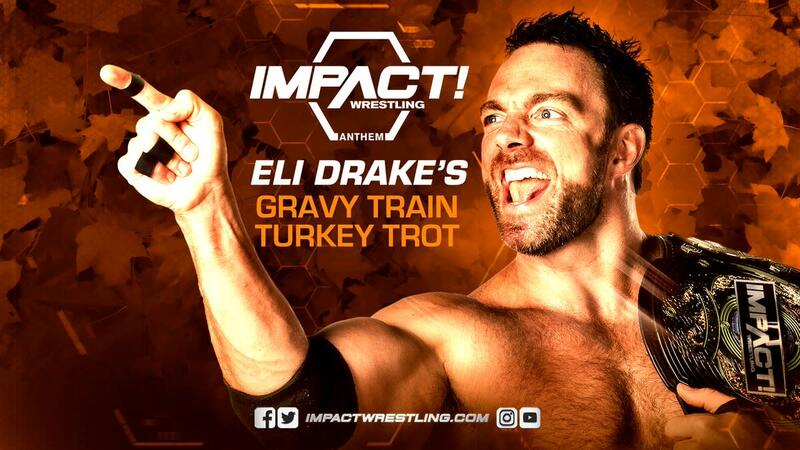 Adonis was upset after being drawn as the team captain, and Drake changed the name of the match to Eli Drake’s Gravy Train Turkey Trot. Young had the advantage and started to do the chicken dance. Referee Rudy Charles joined in on the dancing and missed Robbie using a foreign object to score the pin. Charles found the object and restarted the match, then Young won with a piledriver. Robbie E was unconscious following the match, so Young chose Robbie T to wear the suit instead. Grado attempted a sunset flip, but Robbie dropped down to score the pin. Grado put on the suit after and started dancing. The member of the losing team that gets pinned will be forced to wear the Turkey Suit. Before the match, each team sat at a table and ate a turkey dinner. They also had to take an oath and swore to put on the suit if they are the one that gets pinned. Baah missed a charge in the corner and the heels took over. He recovered and tagged in Garza, but the heels gained the advantage again and isolated him. Edwards got the hot tag and ran wild. The match broke down and a brawl broke out. Justice attempted a dive before the other guys all caught him. Allie then dove off the top turnbuckle onto all of them. The finish came when Adonis attempted the Adonis Lock and Edwards rolled through to score the win. Adonis refused to put on the suit, with Drake wanting to do a random draw to pick someone else. Adonis tried to leave, but security wouldn’t let him. Borash announced that if Adonis doesn’t put the suit on Drake has to instead. Eventually, Adonis put the suit on and got in Allie’s face because she was laughing. This resulted in everyone getting into a huge food fight at ringside. Adonis tried to pie Edwards, but he moved and Drake got a face full of pie instead. Next Week: Johnny Impact battles Alberto El Patron in a grudge match. Plus, the tournament to crown a new Knockouts Champion begins.